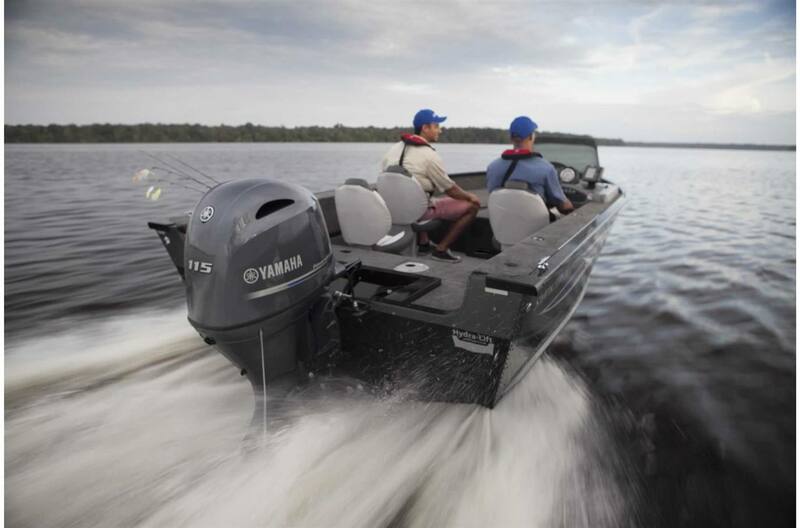 The next generation of Yamaha's F115 is the lightest four-stroke 115-horsepower outboard available. That and a host of great features and benefits means the new EFI F115 is poised to carry on in the Yamaha line as one of the company's best-selling models. Shift Dampener System (Sdstm): Yamaha's patent-pending Shift Dampener System (SDSTM) greatly reduces the noise commonly associated with shifting gears. 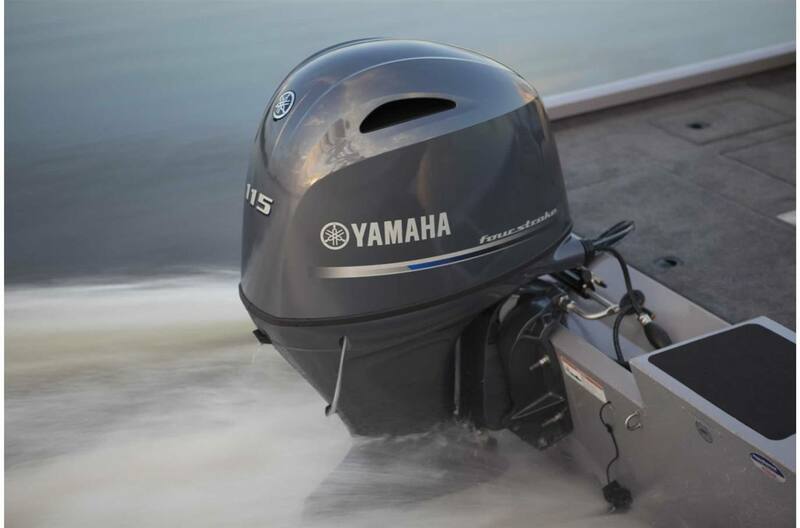 Using a new design and components specific to Yamaha "K" size propellers, much of the force of shifting is absorbed. Standard on Yamaha's new aluminum TalonTM series of propellers, it means smooth and quiet operation when both shifting and while in gear. Talon propellers require no special hardware for proper operation. Variable Trolling Speed (Vts®): Controlled by Multi-Function Tiller Handle or by the Command Link® tachometer, the operator can adjust the engine's trolling speed from 600 to 1,000 rpm in 50-rpm increments, which helps to provide precise and consistent trolling speeds in an array of conditions. Versatility For Repower: The F115 with mechanical control is great for repower with boats that have existing cable controls. At just 377 pounds, it's light, and the F115 has 26-inch mounting centres, ideal for smaller twin-engine craft. 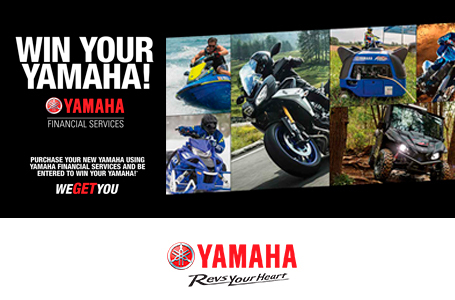 In addition, it has a standard mounting bolt pattern consistent with other Yamaha outboard models, as well as those from other manufacturers. Lighter Weight & Compact: At 377 pounds, the new F115B is 24 pounds lighter than the previous generation (F115LA). Weight savings come from a variety of new materials, such as a composite lower pan and cowling, a single ram power trim and tilt mechanism and a new lightweight mounting bracket. More Powerful: The F115's powerhead is all-new with increased bore and stroke, now measuring a full 1.8 litres. At the same time, this double- overhead cam (DOHC) four-cylinder design gets larger intake and exhaust valves for easier breathing, more power and better midrange torque. Complementing the new valves and cylinder head is a new 60-mm single throttle body with Yamaha's long intake track system, and a new free-flow exhaust manifold. Compression ratio is increased, and so is the full-throttle rpm range: 5,300 to 6,300. A knock sensor, an unexpected feature in this class of outboard, allows the engine to operate constantly at peak output. The result is terrific acceleration and a zero-to-200-foot time that's 0.7 sec. faster than that of the F115A. Versatile: The F115 is just right for so many kinds of boats: pontoons, bay boats, fish'n'skis, sport boats, deep V aluminum boats, RIB inflatables and more. Its lightweight, high-strength mounting bracket uses the same mounting holes as most other models of outboards. Available in three models, it can be equipped for either remote control or use with a tiller handle. Like its big brother, the F150, the F115 comes in both left and right-hand rotation for use in twin applications. Better Charging: The new alternator delivers more power than before: 35 amps at wide open throttle (compared to 24 for the previous F115) producing a full 28 amps at only 1,000 rpm. Quiet: Designed for improved smoothness and quiet operation, the F115 has an all-new exhaust system and reduced vibration thanks to a harmonized inertial mass flywheel and large-capacity rubber engine mounts. 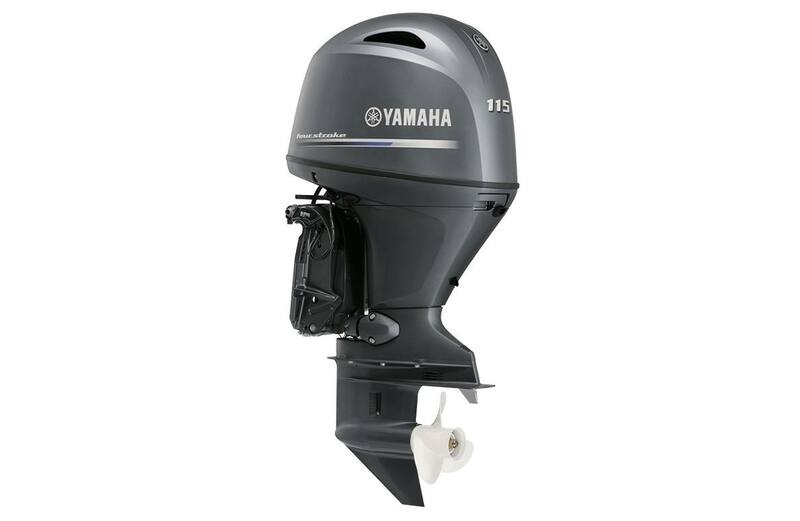 Yamaha also has a new line of SDS™ propellers specifically for this outboard. Bringing the smooth and quiet operation of Yamaha's exclusive Shift Dampener System, these new props deliver quiet operation and meet the performance needs of Yamaha's new F115B perfectly - both when shifting and when in gear. Named Talon™, these new props range from 9- to 16-inch pitches and are ideal for a variety of applications. Of course, Yamaha's Endless Propeller Solutions means a host of conventional aluminum and stainless steel propellers are also available. Convenience: Even with its improved power, the new F115 still runs on regular 87-octane gasoline. 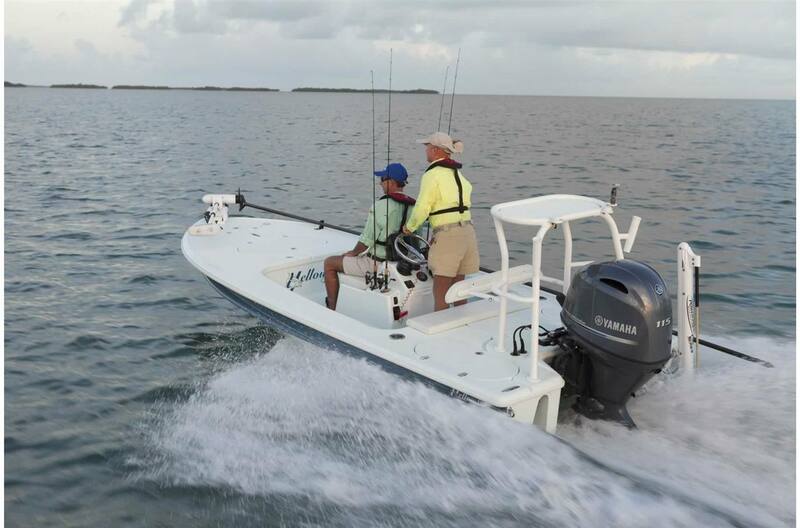 It also has popular features such as Yamaha's Variable Trolling RPM Switch (VTS®). 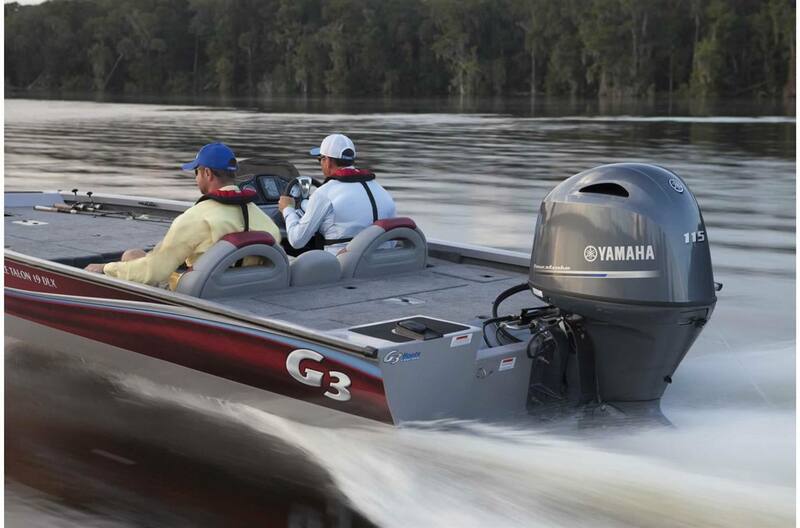 Models have mechanical control, and are compatible with Yamaha's Command Link® gauges and hardware. F115B models can be rigged to external NMEA-2000® compatible displays using a gateway device or analog gauges. In addition, this new outboard is Y-COP® compatible. 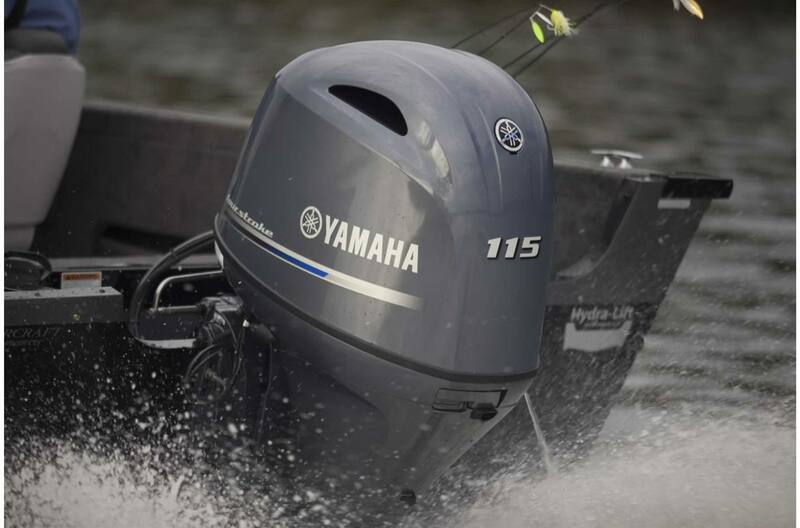 Reliability: Based on proven Yamaha four-stroke, marine-specific architecture and years of solid performance, the new F115 also uses Yamaha's Phaze Five™ paint process. This process includes the electro-deposition of anti-corrosive paint on both the outside and inside passages of the engine block. Inside the engine, dimpled cylinder sleeves, like those used in the Yamaha F350, reduce weight and add strength. They also aid in heat transfer and help to keep the engine reliably cool. Degree of Trim/Tilt: -4 deg. through +16 deg.